Hypnotherapy by Jenny offers services to help people resolve internal conflicts and make amazing positive changes in their lives through hypnotherapy and related natural, holistic techniques. ** and so much more! Jenny is passionate about helping you return your body to it’s natural balance so it can heal itself and you can live a better life in the most natural, holistic, and lasting ways possible! As you can see by the illustration above, research has shown that hypnotherapy is much more effective and efficient than most other traditional forms of therapy. Unlike some other approaches to mental and physical health treatments, our business model is not to attract a lot of long term clients, but to help clients see results as efficiently as possible so that friends and family are referred to us or that those clients may come back to work on different issues that may arise in the future because of how successful and supportive their previous experience was! We will not suggest additional sessions unless we think there is truly more work to be done to make the changes stick. However, it is rare that a single session will provide the entire transformation needed. We do offer discounts for multi-session packages in addition to referral discounts, and compared to even just the co-pays for sessions with therapists who are covered under insurance, the effectiveness of hypnotherapy ends up being significantly cheaper! For more information on things hypnotherapy can help with, visit our Hypnotherapy page. Check out this video for a scientific explanation of how we can take our health into our own hands. This doesn’t specifically reference hypnotherapy, but the more general power of the mind to heal our bodies. 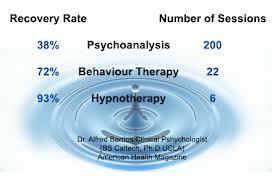 Hypnotherapy happens to be a very effective way to facilitate that!! …and it can certainly be done without a hypnotherapist, just like weight loss can be achieved without special programs, trainers or coaches, but having a knowledgeable facilitator and supporter can make a huge difference for some, so that’s where a good hypnotherapist comes into the picture. For more information on other services (e.g., training, public speaking) and products (e.g., essential oils, cleanses and other healthy food options) that Jenny recommends, check out EPIC Renewal Concepts. Contact us if you are interested in hosting Corporate Training or Community Seminars to help as many people as possible experience more internal and external harmony and balance in their lives. Check our community calendar to see when we’ll be giving a free informational class near you! !